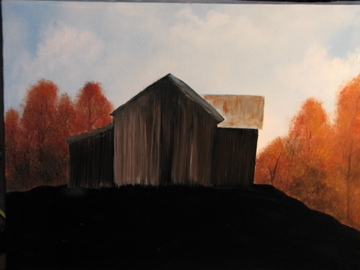 Since fall is my favorite time of year, the season of my birth, and I have a pension for old barns…I decided to try my hand at painting a “fall-themed” old barn. My memories of autumn in the Midwest will never leave me. The changing of the Autumn leaves in Brown County, Indiana is a veritable cornucopia of color for the eyes and senses and one that you should see at least once in your life. The brilliance is quite honestly stunning beyond belief! Seeing the change of seasons is a process I continue long for to this very day. California has some changing leaves but no where near the drama of the midwest and east coast. 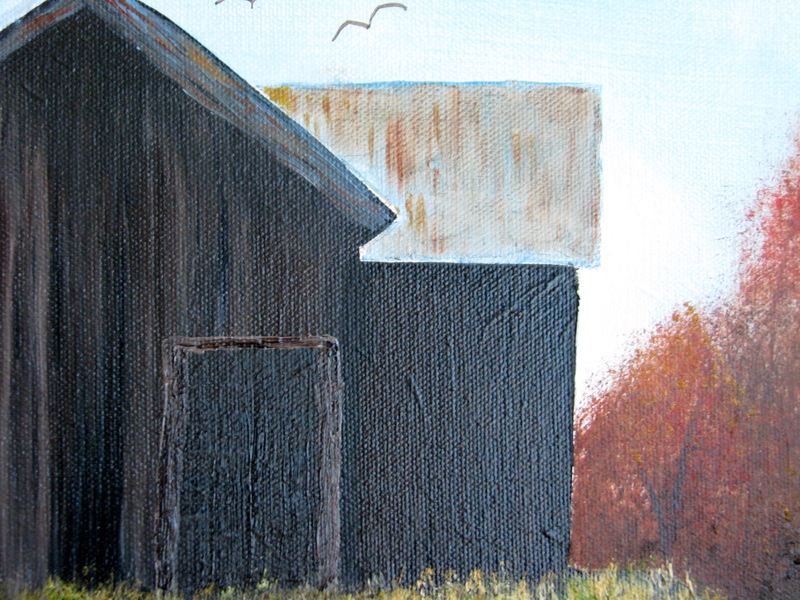 The following 22 photos will take you through the main steps and progression of how I oil painted this old barn. It should be noted that this is not an original painting. It is a copy of a painting by Wilson Bickford. It was more involved than it may appear and I wanted to show how I arrived at the final piece. 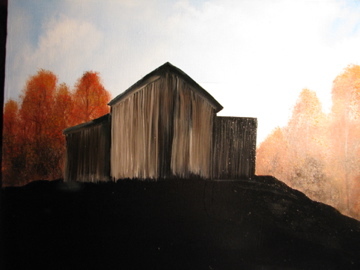 This was a really fun and challenging exercise for me….and as some of you may recall, I happen to love old barns as evidenced by one of my older posts. 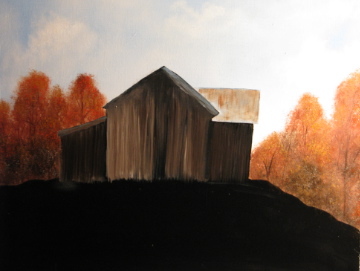 You can find the “Beautiful Tobacco Barns and a Dilapidated Log Cabin” post in the archive list to the right. 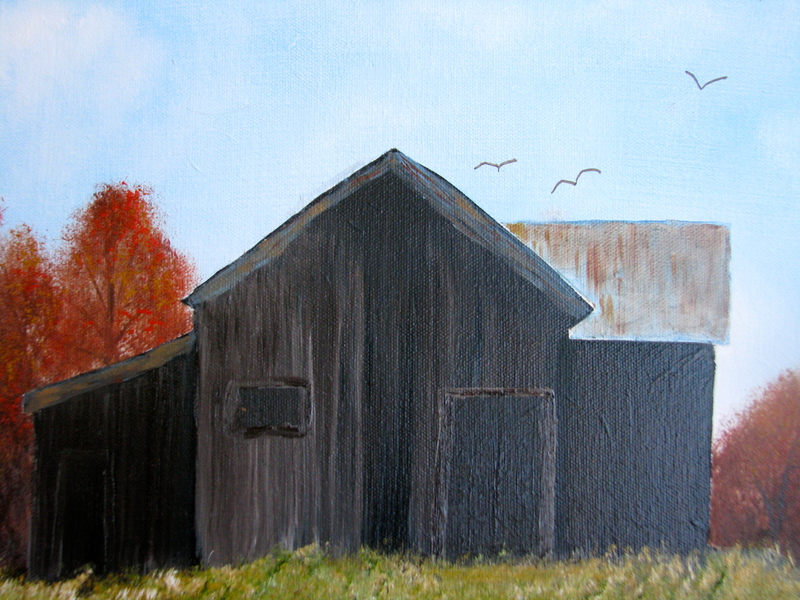 I started out by sketching (freehand) a two-point, simple perspective of a barn. 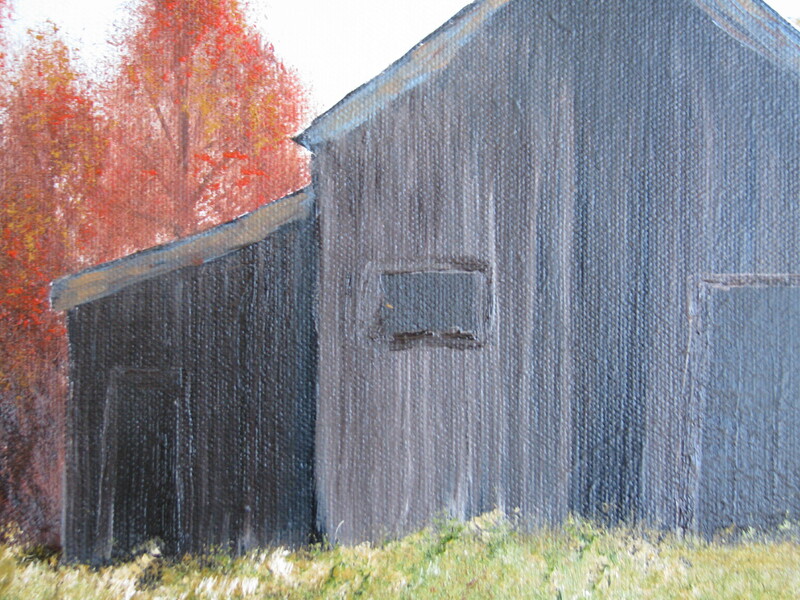 I then painted the barn and the surrounding meadow/grass in with black acrylic gesso. It is imperative that if one uses an undercoat of acrylic paint you must allow it to completely dry before applying oil paints on top or you will have a mess. I used a blow drier to help speed up the drying process. Remember, you can paint oil over acrylic but you should never paint acrylic over oil. 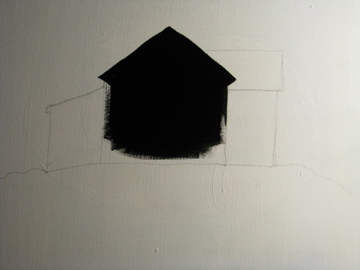 The undercoat of black gesso provides a rich foundation on which to paint the surface of the barn and the grass. I had never used black gesso before and I must say I am very happy with its effects. 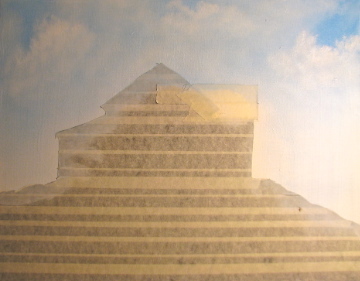 I then placed regular old masking tape over the barn and meadow. 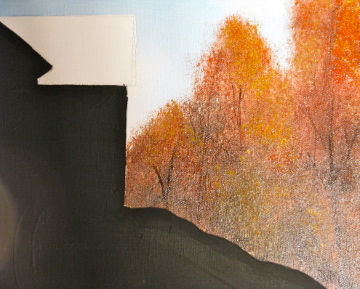 This was done to make my life easier when I went to paint in the background and surrounding trees. 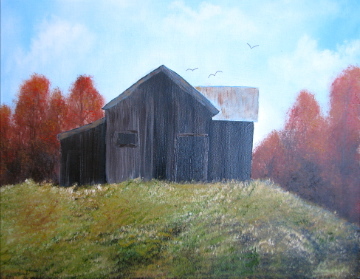 It allowed me to freely paint without having to worry about compromising the underpainting of the cabin and grass with the Cadmium Red and Cobalt blue used for the trees and sky. I then took an Exacto knife and carefully carved around the outline of the gesso. This was not as easy as I thought it was going to be. You have to have just the right amount of pressure when cutting. If you are too light, when you go to remove the tape, you will end up pulling off more than you want and it just becomes a mess (this happened to me). 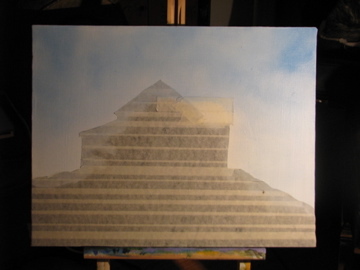 If you are applying too much pressure with the knife you will slice right through your support….if it is canvas. Next time I will use a rigid support, like wood, before I attempt this again. Even though I did actually slice through the canvas once, it didn’t end up being an obvious mar on the surface. 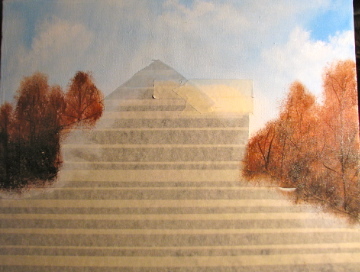 After the tape has been secured and cut with the rough edges removed, I began blocking in my background sky, clouds, and the neighboring trees. 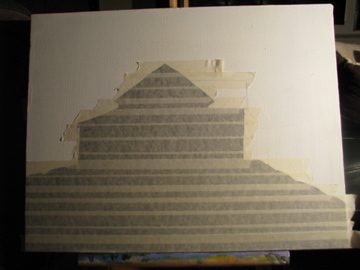 I then carefully removed the tape to reveal the black underpainting. 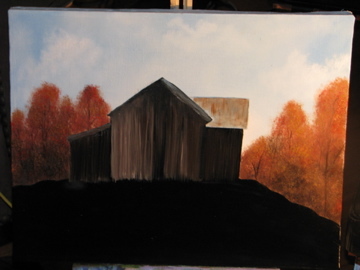 Now the fun began….I started painting the barn. 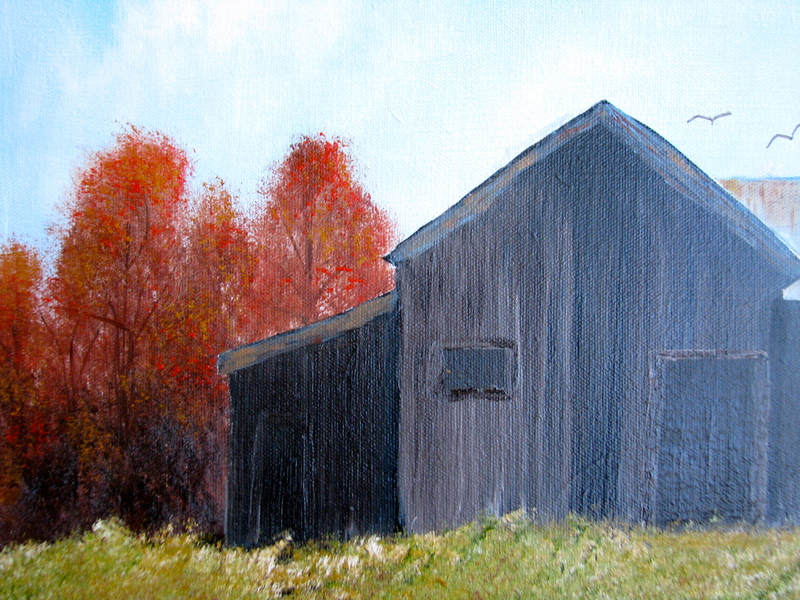 In order to get a realistic-looking ‘old barn’ rough, splintery surface, it was suggested that I use a rake brush. Try though I might….not one art store carried this type of brush…..so……I simply made my own. Yes, I bought a cheaper size 12, synthetic flat brush and used my good, old fashioned kitchen shears. I simply cut and created a jagged and rough edge along the base of the bristles. 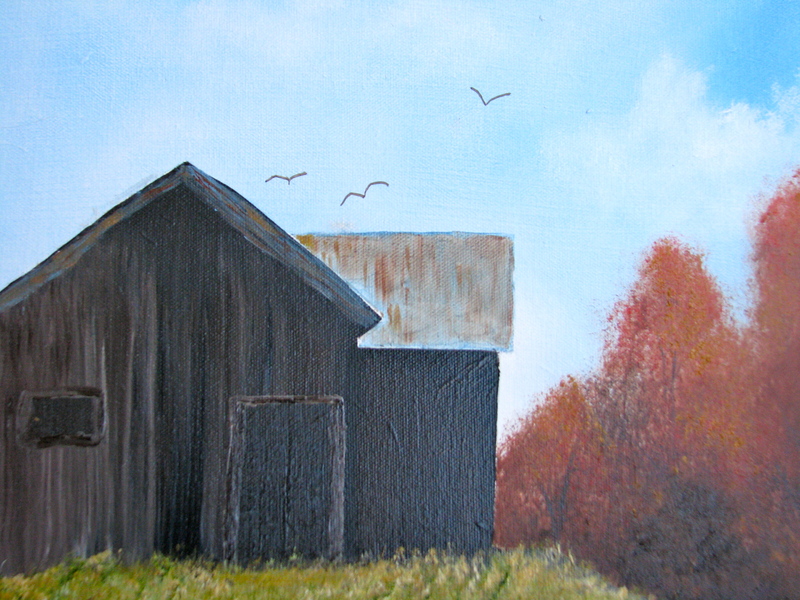 This turned out quite well helped to create a realistic looking surface of an old barn. Again, when using a rake brush the pressure you place on the bristles is key. It must be a very light touch or else you won’t get the splinter effect. 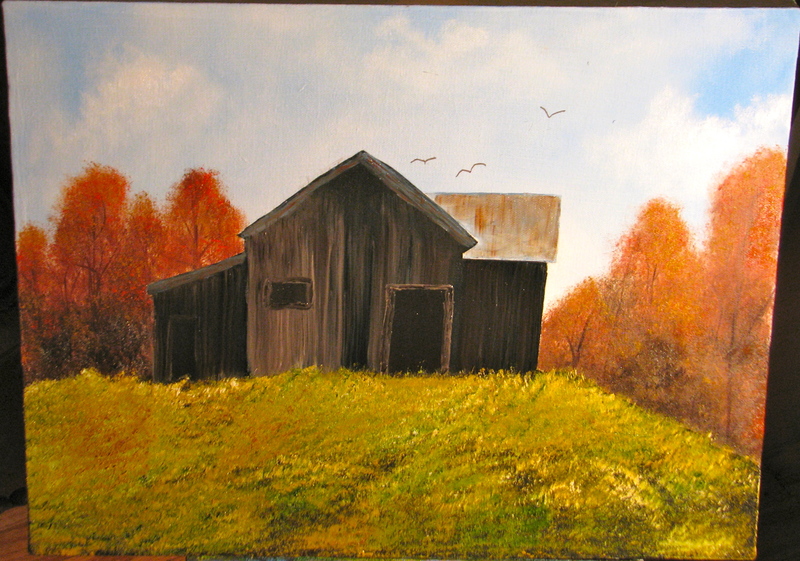 After painting the barn, I finished the painting off with creating the grassy meadow. 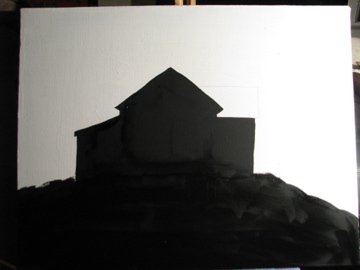 I am frankly not thrilled with the current look of my meadow; however, I plan on painting this piece again in order to really perfect the results….or attempt to at least. I hope you enjoy viewing this process as much as I enjoyed painting it. I hope you have a wonderful finish to your week! I just wanted to share the painting that I have been working on for the last few days. I finally finished it very early this morning. 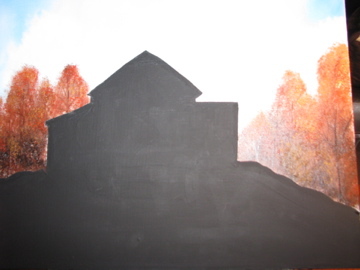 It is entitled “Fall River”. It is reminiscent of my childhood days growing up in Indianapolis, Indiana. My father built a log cabin on the White River. This painting loosely resembles this Indiana river….and so many other midwestern tributaries….except for the blue color. The rivers and creeks of my childhood were muddy in color, not sky blue. I remember dreaming and wishing the waters in Indiana could be a translucent blue, like Tahitian waters. Ahhhh, a girl can dream, correct? I was born in October…perhaps that is one reason why the fall season is my absolute favorite? I deeply miss the transition of the vegetation in the midwest. The vibrancy of the leaves and bushes is unparalleled. We do not get this particular blessing here in San Francisco…or at least not at the extreme that one experiences in the midwest. 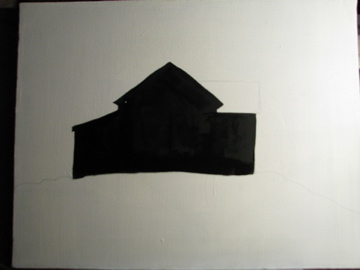 This painting was particularly challenging for me, throughout the entire process. 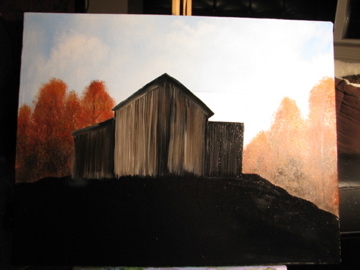 Even though it was difficult for me to paint, the end result is pleasing to me…and I am always up for a challenge. 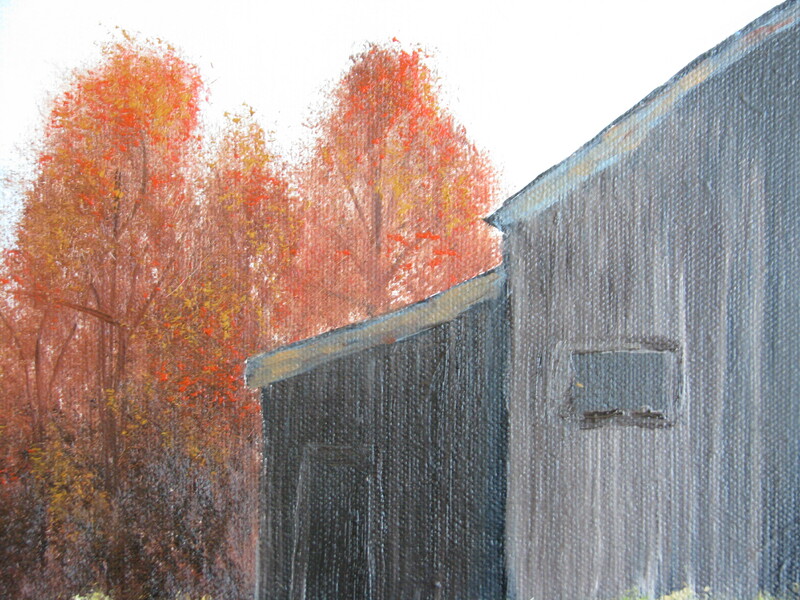 I hope it is pleasing to you as well….even IF it is a little early for fall leaves….